Back and neck pain, especially because of pinched nerves, slipped or herniated disks, sciatica, and scoliosis, are serious and long-lasting health problems for many people. That’s where inversion therapy enters the picture. The right inversion therapy equipment takes pressure off your neck and back to relieve much of your pain and tension. It’s also perfect for those looking to improve posture, stand taller, and increase overall fitness. What type of inversion therapy equipment are you looking for? A quality inversion table relieves pressure from your neck and back through spinal decompression. Suspend yourself from the ankles or legs to achieve these benefits. Like inversion tables, an inversion chair helps relieve pain through spinal decompression. The key difference is that it does so without placing any stress on the knees, hips, or ankles. Inversion boots (or gravity boots) take spinal decompression to the next level. 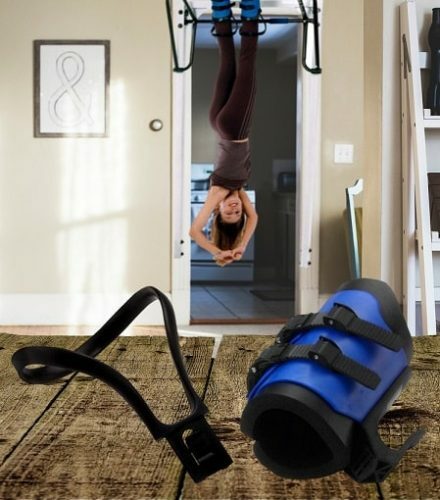 Instead of suspending you from a table or chair, they enable you to vertically hang completely upside down from a solid bar to provide traction to your back and neck. Yoga headstand benches are the ultimate in inversion therapy equipment. Instead of suspending you under their power, they allow you to suspend yourself. They provide all the same benefits as other inversion therapy methods but also work your core muscles. The goal of stretching the spine, also known as spinal decompression, is to relieve the pressure and tension placed on the back and the neck. The release of pressure and tension then reduces neck and back pain caused by any number of ailments, including pinched nerves, slipped discs, herniated discs, sciatica, and scoliosis to name just a few. The way that inversion therapy provides this pain relief is by harnessing gravity. Suspending your body upside down not only eases normal pressure from the back, but it also provides traction for the spine. In addition to those with chronic back or neck pain, inversion therapy is also ideal for those suffering from scoliosis. 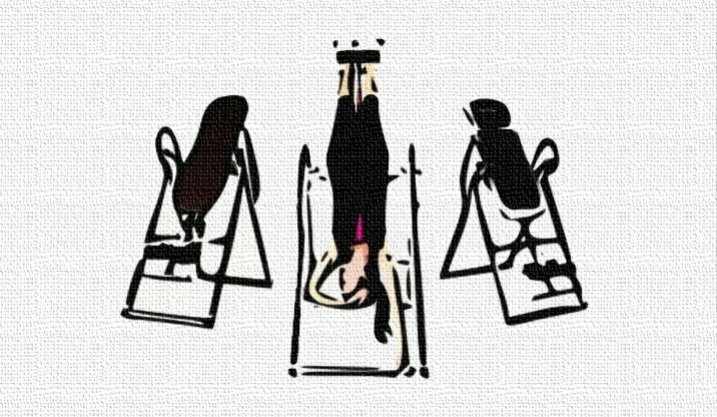 A less common, but still effective, reason to use inversion therapy is to improve posture as well as overall physical fitness. 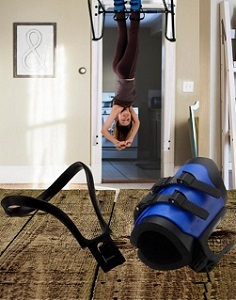 Inversion therapy equipment is now available in several forms, including tables, chairs, boots, and headstand benches. The right type of equipment for you depends on your needs, preferences, budget, overall health, and any personal recommendations from your doctor. The benefits of inversion therapy are numerous. The most obvious is pain relief, particularly for chronic neck and back pain. The Mayo Clinic claims that this benefit is mostly short-term, with few long-lasting benefits. That said, the release of pressure, even for just a few minutes, does wonders to release pain and tension stored in damaged or stressed neck and back muscles. Indeed, the Mayo Clinic goes on to state that while inversion therapy benefits are mostly short-term, they can provide long-lasting pain relief when paired with a comprehensive treatment program. For this reason, inversion therapy is well worth your consideration if you suffer from back or neck pain. HealthCentral states that inversion therapy helps relieve back pain by generating more fluid to protect spinal discs while simultaneously removing waste from the region. The generation of this fluid and removal of the waste decreases inflammation while promoting increased blood circulation in the muscles surrounding the spine. Not only does this process reduce back and neck pain, but it also improves overall spinal health. Improved Flexibility – Spinal decompression makes it easier to bend and reach after continual practice. Better Posture – Added flexibility also translates to better posture, especially while sitting (which is of utmost importance if you have a desk job). Increased Height – Some people say that inversion therapy even increases your height by one or two inches (though this is probably due to better posture). Better Fitness – Athletes, in particular, get benefits from inversion therapy as it relieves pain and increases flexibility to enable them to train harder and perform at a higher level. Reduced Need for Surgery – Though the jury is still out on this one, a 2014 study submits that spinal decompression potentially reduces the need for spinal surgery by easing back pain. Remember that no matter how great the benefits of inversion therapy sound, it’s imperative to seek the advice of your doctor before trying out the technique for the first time. Inversion therapy isn’t without its risk – and it’s certainly not for everyone. As mentioned above, it’s essential to talk to your doctor before trying out inversion therapy for yourself. Inversion tables and other inversion equipment is particularly risky for people with glaucoma, heart disease, or hyper tension. Your doctor will also likely recommend avoiding inversion therapy if you’re pregnant, obese, or use blood clotting medications. Even if inversion therapy is safe for you, it’s essential to use the equipment correctly. Improperly using inversion tables, chairs, and other devices is extremely dangerous. Another concern is taking the proper time to adjust. Chances are your body isn’t used to being suspended upside down. You’ll want to start with short increments of suspension, perhaps a minute at first. Do several one-minute sets with breaks in between to adjust your body to the process. Before long you’ll be able to comfortably suspend vertically for five to ten minutes or more. Pay attention to how your body feels. Dizziness or muscle strain are sure signs that you’re overdoing it and need to take a break. Research into inversion therapy is still a fairly new pain management technique. There’s no hard and fast answer whether it works or not. Though the short-term benefits are mostly proven, the long-term benefits are another story. Most people will experience pain relief from inversion therapy, in various degrees. You’ll likely notice increased flexibility, better circulation, and pain relief almost immediately. Indeed, improved flexibility and posture are likewise proven. Inversion therapy works if these are your goals. The only areas in which inversion therapy’s benefits aren’t 100% proven is in the long-term. Not enough research has been done to verify its effectiveness. It’s important to note that most researchers believe inversion therapy is effective for long-term pain relief if you combine it with other treatment methods. On its own, inversion therapy isn’t likely effective for more than the short-term relief. Paired with other physical therapy and treatment techniques, however, it’s chances of long-term success skyrocket. Which Inversion Equipment to Buy? There’s a surprisingly wide variety of inversion therapy equipment on the market today. Your classic option is an inversion table. You lay on a table-like platform, strap your legs in, and then tilt the table to one side, so your head is lower than your feet. You can control the angle at which you’re suspended with a lever. Most inversion tables have an almost vertical angle of maximum suspension. 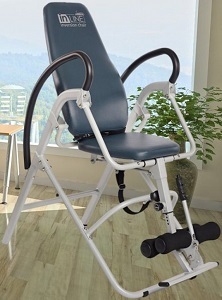 A newer type of inversion therapy equipment is the inversion chair. It’s designed to place far less stress on the hips, knees, and ankles. Though you still strap your legs in, there’s also a secure lap belt to better distribute the pressure. Inversion chairs are also ideal for those with a lower level of physical ability. They’re far easier to use if you’re elderly, overweight, or injured. Inversion boots are yet another option. However, these require a high level of physical fitness to use properly. You strap your ankles into half boots with book-like clips on them. The clips them go over a bar. They enable you to hang vertically from the bar with your head below your feet. Inversion boots are extremely dangerous if not used correctly. We recommend you use them only if you’ve tried a regular inversion table or chair first. Your final option is a yoga headstand bench. This type of inversion therapy equipment is different than the rest. The goal is to perform a handstand to achieve some of the benefits of inversion therapy, instead of having your feet suspended by the device. No matter the type of inversion therapy equipment you choose, it’s essential to consider your personal needs, preferences, and overall health. Another concern is your budget. Certain models are much more affordable than others. However, a high-end model has the benefits of better materials, increased durability, more comfortable padding, and additional features. We also recommend buying new rather than used. A used inversion table is a recipe for potential disaster. It’s hard to confirm that a used inversion table isn’t dangerous. Sometimes the materials wear down to the point where they won’t support your body. Other issues include a difficult time properly adjusting them. 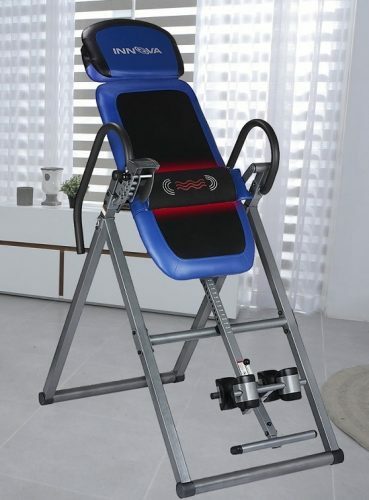 The best inversion table bar is none other than the Innova ITM4800 Advanced Heat and Massage Therapeutic Inversion Therapy Table. If you want the absolute best of the best, this is it, no questions asked. The extremely popular table is constructed from high quality components, performs seamlessly, and lasts for years on end. Massage and heat features help this product stick out. Multiple settings enable you to receive a massage through the lumber support padding. Combine the relaxing massage with heat for the utmost in therapeutic benefits. The padding itself is extremely comfortable. It’s made with large energy foam blocks. The padded headrest is adjustable to your preferences. Ergonomic ankle holders make strapping into the inversion table likewise comfortable. A 5-position pin system ensures you are secure during use. The pins also ensure that you receive the same angle of inversion each time you use this equipment. This Innova inversion table equipment also comes with soft-touch foam handlebars. These help you get back to your upright position without the help of a partner. Innova created the ITM4800 with simplicity in mind. The goal was that all users, no matter their age or level of personal physical fitness, can use it with ease. The product is suited for all users between 4’10” and 6’6”. The maximum weight capacity is 300 pounds. 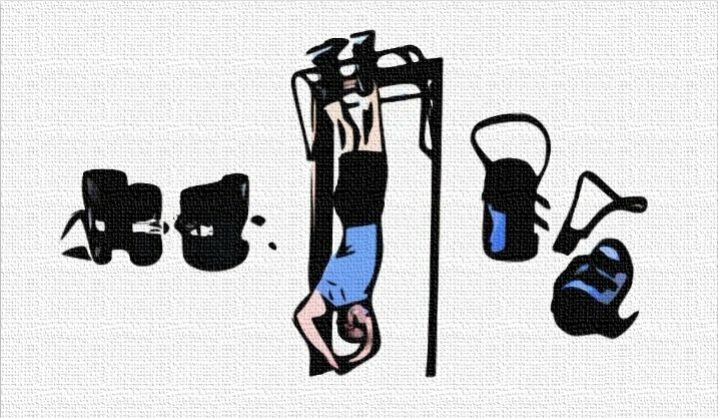 Is an inversion table too intense for you? If you still want to reap the rewards of inversion therapy equipment, then the Stamina Inline Inversion Chair is worth a look. The affordable inversion chair is a slightly more comfortable, secure option than an inversion table. It performs all of the same benefits include spinal decompression and strengthening. Though the chair is undoubtedly effective, the main highlight is its comfort. Getting into and out of the chair is a cinch. The entire chair is covered in plush, comfortable padding. This combination of ease of use and comfort makes the Stamina Inline Inversion Chair the perfect fit for the elderly and others with limited mobility. The ratcheting leg lock system (with foam-padded ankle support) and adjustable lap belt ensure you’re secure. Once strapped in, you change the angle of inversion with the inversion-angle adjustment strap. To prevent damage to your home Stamina included skid-resistant rubber floor protectors. This is a relatively uncommon touch we’d like to see from all other manufacturers. Finally, the inversion chair can be adjusted to fit a wide variety of sizes. It holds up to a maximum of 250 pounds. If you’re looking for the best inversion boots on the market, there’s no better option than Teeter Hang Ups Gravity Boots. These gravity boots offer a unique twist on inversion therapy equipment. Instead of an entire table or chair, all it takes to achieve inversion is the boots and a secure inversion rack. The idea consists of strapping the boots to your legs. You then hang from a secure bar by strapping the boots to it. Your head hangs completely below your feet with little to no support. Though this method is only for those in good shape, it’s arguably the most effective for spinal decompression (when performed safely and correctly). Part of what sets the Teeter Hang Ups Gravity Boots apart from other inversion boots on the market is their versatility. These inversion boots can be used with a sturdy bar (such as a chin up bar at the gym), the Teeter inversion rack, or even with an inversion table. Another highlight of the boots is their comfort. The extremely lightweight design is complimented by thick foam padding for the utmost in comfort. Adjustable, self-locking ratchet buckles ensure a snug fit. Each component is seamlessly fused together for incredible strength and durability. You’ll feel (and be) safe and secure whenever you use your Teeter inversion therapy equipment. If you’re looking for the best blend of inversion therapy and yoga, then I recommend the Original Bodylift Yoga Headstand. It provides many of the same spinal decompression benefits of the best inversion tables and chairs, but with all the benefits of yoga as well. The catch is that it requires practice and patience to master. Unlike an inversion table or chairs, most people require a learning period for proper use. Use the yoga headstand bench by performing a yoga headstand on it. Most beginner and intermediate users should use a wall or a partner to help support their legs. Holding the headstand pose helps decompress your spine to relieve back pain and tension in the same way as other inversion therapy equipment. Additional benefits of the Original Bodylift Yoga Headstand include decongested internal organs and improved circulation. Evolution Health, the creator of the device, also claims that performing yoga headstands on a regular basis also relieves anxiety and stress, improves digestion and metabolism, and stimulates the nervous system. Another benefit is improved physical fitness. Performing a proper headstand takes a lot of physical effort, resulting in much stronger core muscles. 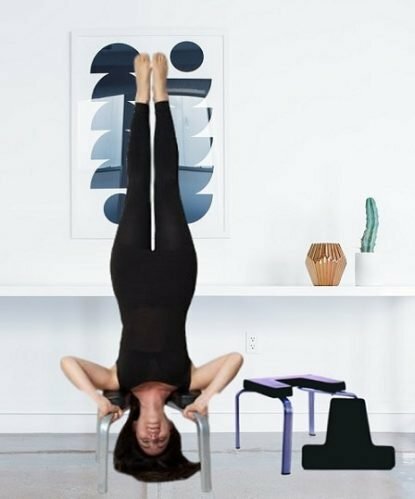 Be sure to note that while this yoga headstand bench does require a certain amount of strength and flexibility, it doesn’t require the expert balance of many other headstand benches. To achieve the full benefits of inversion therapy, it’s essential to invest in the right equipment, whether that’s a table, chair, or boots. Still, it’s possible to achieve many of the benefits without equipment. The number one way to do this is through stretching. Try basic stretches and yoga poses to reduce back pain. Find stretches and poses that specifically target the back and neck areas to get the best results. Any yoga pose that has inverted elements is a great choice. The most basic is the downward-facing dog. It’s a great pose for beginners. Other yoga poses that offer a form of inversion therapy include the feathered peacock, plow, supported shoulder stand, handstand, and supported headstand. Yoga is also a great tool to get even more benefits from your inversion equipment. It increases flexibility, so actual inversion therapy helps your body even more. There are several ways to reap the rewards of inversion therapy without investing in inversion therapy equipment. 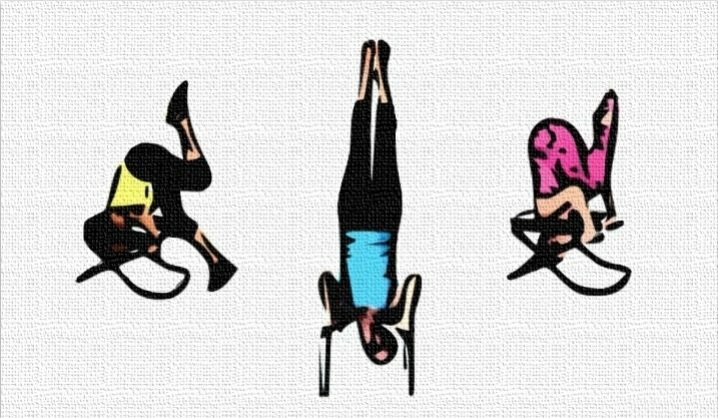 Like inversion therapy without equipment, these alternatives are effective, but not quite as effective as using an actual inversion table or chair. As mentioned above, the number one alternative is yoga. A routine filled with the right poses can help you achieve inversion while also improving your overall fitness and reducing stress in the process. Another alternative is fitness ball exercises. You can use a fitness ball, such as an inflatable Swiss ball, as a surface for inversion. Place your back across the top of the fitness ball and hang your head downwards. Have a partner firmly hold your feet and lift them upwards. Though the fitness ball alternative does provide a lot of inversion therapy benefits, it’s not everyone. It requires a fair amount of physical fitness and flexibility to begin with. The final alternative is one we’ve already discussed above – gravity boots. Also known as inversion boots, these provide a form of inversion therapy. You hang upside down from an inversion rack through a series of secure straps. The technique provides all of the same benefits of inversion therapy except that it requires supreme physical fitness to use safely and correctly. 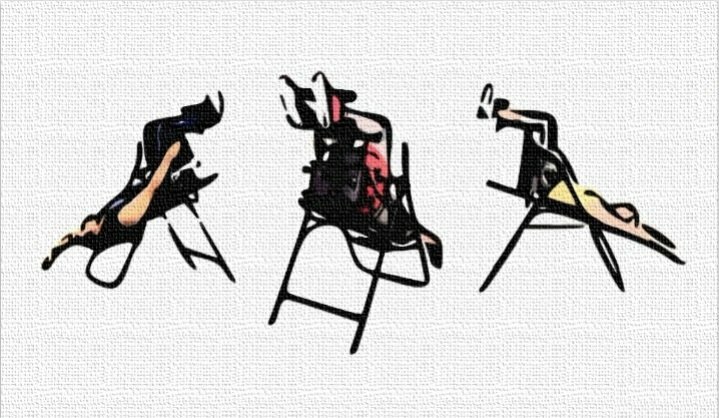 Remember that a standard inversion table or chair is usually the best bet for the vast majority of people interested in this popular pain management technique.